The heart of your data - made simple! With 123Landlord it's easy to keep track of lease terms, due dates, and move outs. All lease information is integrated into every tenant and property view - no more hunting for start dates, rent rates, and other important information. 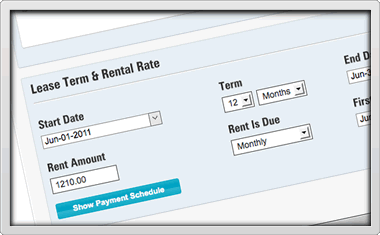 123Landlord supports all common late fee scenarios, including flat rates, per day fees, percent of rent derived fees, grace periods, and maximum (capped) late fees. Keep track of flat fee deposits, first/last month's rent, and when deposit is due. Add information about the other payments your tenants make regularly, in addition to rental payments, such as garage fees, key deposits and replacement fees, parking or pet fees, storage fees, or utility/water charges. Renew expired tenants, increase the rent and specify the new terms of the lease with just a couple of clicks. A dedicated move out workflow will let you move existing tenants out, free up the property for lease to another tenant, and archive prior payment history.